Some Mud - If your not prepared to "send it" this isnt the trail for you. Massive stone made lips and unforgiving gaps make this trail epic. Expert line. This trail allso needs a little grooming. Some Mud - Frequent muddy patches but dry for the most part. Some Mud - fun little trail with some rollers, followed by a double then a small drop but CAUTION lower part of the following berm is washed out. take it high then a nice kicker at the bottom of the trail. Wooden feature leading into jumps. Wooden drop in to berm. 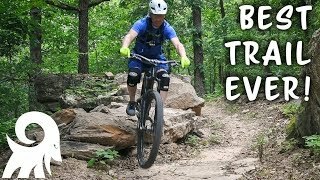 Giant rock berm on "Best Trail Ever".